[UPDATE #2 - July 9, 2015] Google Android security team confirmed that the fake application was uploaded to the Google Play Developer Console by the miscreants. However, as per Google's Android team the fake app did not make it to the official Google Play Store as Google's security system flagged the fake app during scanning. Create a malware app from scratch. Compromise a legit app by embedding malicious modules into it. With Android being open source and an Android app being easily reversible, most of the malware developers tend to stick with the second option. We came across a malicious app recently that followed this path. This time the spoofed app was a copy of a legit app named BatteryBot Pro. 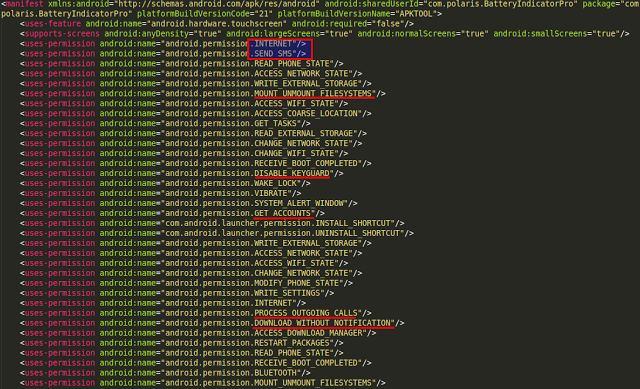 The spoofed app had the package name of 'com.polaris.BatteryIndicatorPro' and was removed from the Play Store as soon as Google became aware of it's malicious intent. Upon installation of the malicious app, it demanded administrative access, which clearly portrays the motive of malware developer to obtain full control access of the victim's device. 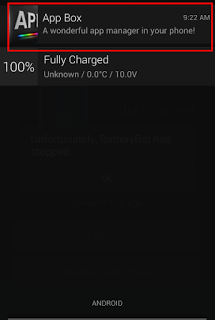 Once the permission is granted, the fake app will provide the same functionality to the victim found in the original version of BatteryBot Pro but performs malicious activity in the background. Though the app seems to be working normally, at the back-end it tried to load various ad libraries, ultimately delivering a click fraud campaign. Some of these URLs were hard coded in the app and some were sent by the remote server. The following screenshot shows the data being collected. This malware was not only built with the purpose of displaying ads, it was also designed with more evil intentions. The main Activity Screen is identical to original app but when the user clicks on "View Battery Use", the malware sends a few requests to its Command & Control server to retrieve short codes. These short codes were premium rate SMS numbers where a message was sent. This will result in financial loss to the affected user. Though the content was encoded, we did not have to work hard to determine what was sent as the malware developer forgot to remove the logs. The server responds with short codes that are used for sending messages. The following screenshot shows a premium SMS response received from the server. Apart from displaying ads and sending SMS message, the malware is also very persistent. Being run with administrator privileges, the user cannot delete the app after installation. While in some of the scenarios we were able to manually delete the app, the malware authors have taken care of ensure persistence. The malware silently installs an app with a package name of com.nb.superuser, which runs as a different thread and resides on the device even if the app is forcefully deleted. This acts as a service and sends requests to hard-coded URLs found in the app. The screenshot below shows the hard coded URLs. The service started by this app continually sends requests to aforementioned URLs, some of which will deliver new APKs. The Malware we saw in this blog was designed with multiple evil intentions including ClickFraud, AdFraud, Premium rate SMS fraud and the download & installation of additional malicious APKs. A few traces of command execution were also seen in the app but were not fully implemented. Perhaps the developer is working on an upgraded version of the malware with proper "command-execution" functionality. The ThreatLabZ team will continue monitoring new mobile malware threats and ensure protection for Zscaler customers.